In my community women have no rights….When I was 14 years old I was being forced to marry, my brothers [and] my father [told me] “you are a woman, you have to obey what we say.”…When my father realized that I didn’t want to marry he told me “you have to be locked up because if not the young men will see you and they will keep coming”…And he locked me up for three years without being able to leave my home…It was like hell for me. Those are the words of Patricia Perez Gomez, known as Paty, a Tsotsil Mayan woman from the community of Poconichin near San Cristobal, Chiapas in Mexico. Like many other women, Paty fought for her freedom, and today she is still fighting. She now works for the Coalición Indígena de Migrantes de Chiapas, A.C.(CIMICH), an organization with IAF funding that works with transnational local committees in seven municipalities of Chiapas to help integrate Tsotsil and Tseltal migrants returning to their communities of origin. Indeed, there is work to be done. A 2013 study by the Economic Commission for Latin America and the Caribbean reported that the 670 indigenous groups recognized in the region include at least 23.5 million women. Although indigenous women have the capacity and potential to be agents of change in their communities, the study found that they suffer economic, ethnic, social, and gender discrimination that makes them vulnerable in many ways. 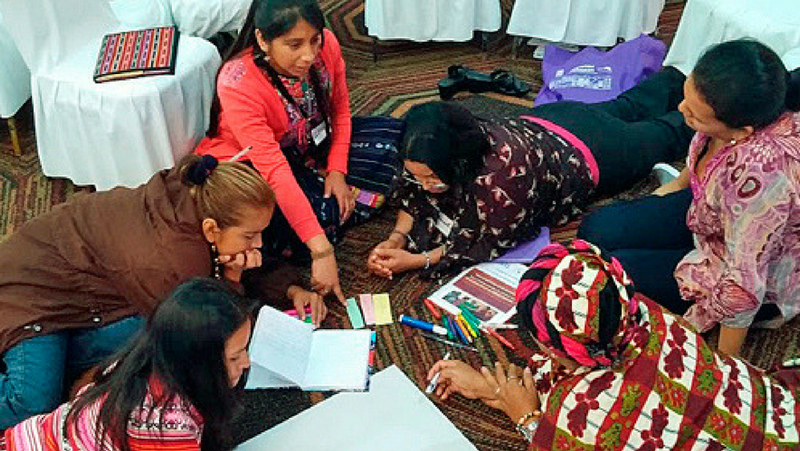 I recently participated in a workshop organized by JASS Mesoamerica, another IAF grantee that examined different training frameworks drawing on what is known as “feminist popular education.” The idea is to build an atmosphere of harmony and equality for all people with a focus on women. Participants included women representing the Chol, Tseltales, and Tsotsiles communities in Mexico, the K’iche’s, Awakatecas, and Q’eqchi’s in Guatemala, and the Kichwas in Ecuador, as well as communities in Colombia, the Dominican Republic, El Salvador, and Nicaragua. The cultural context in Latin America has always favored men, so for indigenous women living in isolated areas it is that much more difficult to effect change within their communities. Women then face the challenge to promote change without being rejected. Change is sometimes viewed negatively in these communities because in the past changes eradicated customs and languages of indigenous populations. Celerina Ruiz Núñez, a Mayan Tsotsil woman, was born in the community of Oventic Chico in the Municipality of San Andrés Larrainzar in Chiapas, Mexico. Nowadays she works with the Centro de Formación y Capacitación para Mujeres K’inal Antsetik, A.C. (CEFOCAM), an indigenous organization directed by women that provides training in cooperativism, leadership, and women’s rights. “Since I was little…I had the idea to get out and learn about new things that we did not have in our community,” she explained. “It was then that I realized that women have the right to decide what they want to do.” Celerina is currently writing her thesis on men’s traditional dress in her community. With the support of these organizations, indigenous women have overcome the idea that they’re inferior to men—an idea ingrained in their customs and often not questioned. Take the case of Vanessa Rodas, for example, a Kichwa woman from a small village in Pastaza Province in Ecuador. Today Vanessa works with the Asociación de Mujeres de Juntas Parroquiales Rurales de Ecuador (AMJUPRE), which provides training for women in leadership and community development. The goal of the exercise was not only to preserve the history of female ancestors who inspired the women at the workshop, but also to remind us that the struggle for women’s rights is not a new concept. During the two days that I attended the workshop, I felt I was in the presence of the next generation of female ancestors whose stories will be retold by their descendants as they continue the struggle for women’s rights. They are women full of wisdom and passion—which they need, because, as a story from Paty reminds us, the task is not easy and far from finished. When CIMICH began a coffee growing project, the men threatened the women in the community so that they would not work with Paty. But she did not stand down. Today the coffee nursery has a 50-by-50 meter shading structure and the women involved are successfully selling their products. Paty’s father came to accept his daughter’s dedication to her work and decided to give her a piece of land as her inheritance, which she then split with the group of women as a symbol of their shared struggle. It was that same shared struggle that brought together the women at the JASS Mesoamerica workshop and that will ensure future exchanges to continue to transform the role of women in all of Latin America and the Caribbean.